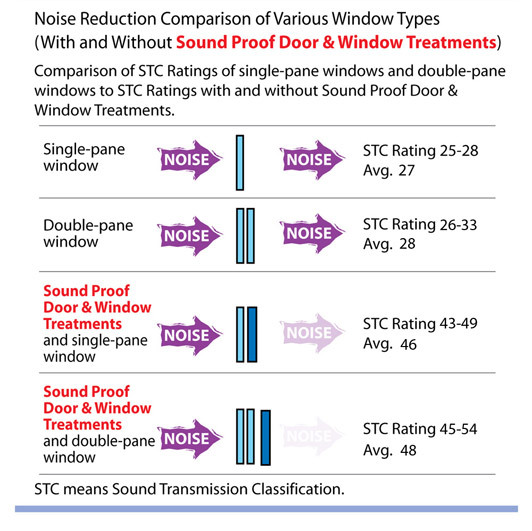 Soundproof window treatments are independent secondary systems installed on the interior side, in front of, but not attached to your existing exterior windows. They are not replacement windows. 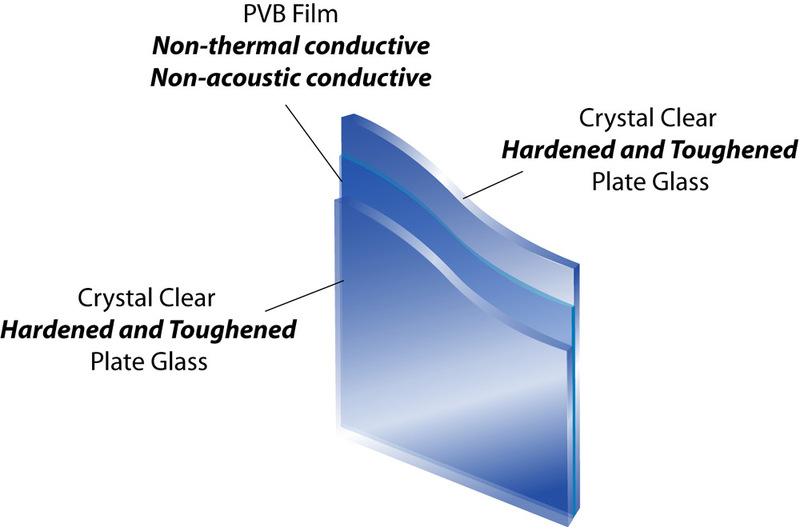 The major components of Sound Proof Window Treatments consist of industrial gauge anodized aluminum frames, and industrial grade rigid PVC track systems, hardened and toughened 3-ply crystal clear laminated plate glass. Up to 95% noise reduction airport noise, barking dogs, etc. Additionally we offer Low-Emissive Acoustical Laminated Glass for maximum energy savings. All of our soundproof windows and doors provide a 10 year warranty on materials and workmanship. Each Soundproof window works in concert with, and capitalizes on your existing exterior window or door, to create a buffer zone insulating dead-air cavity that seals out noise, cold, heat gain and heat loss, drafts, pollen, dirt, odors, dust and UV rays forever. Up to 95% noise reduction (click to see STC chart): airport noise, barking dogs, etc. Our soundproof windows design and fabrication capability enable us to match your exterior windows design and functionality. Windows and doors vary in design and include horizontally & vertically sliding panel windows, fixed windows, fixed removable windows, and hinged panel styles. They are NOT replacement windows. Installations are almost invisible both from the inside and outside of your home or business. Noise from barking dogs and airport noise will be reduced significantly. Landmark commission approval is NOT necessary as our products install on the inside. All of our products are operable (open & close) and are removable for full access to your exterior windows and doors. NO structural changes are required. NO renovations involved. NO messy installation process. One-hour installation leaves NOTHING to repair or repaint. Sound Proof Window Treatments are the choice of architects, acoustical consultants, building managers and owners, interior designers and construction managers world-wide.